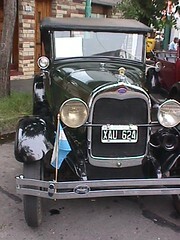 Vintage For Cars from Argentina. 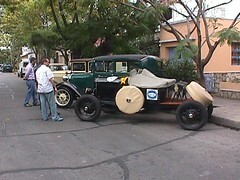 From April 7 & 8th Vintage Ford Club de Amigos, Vincente Lopez. 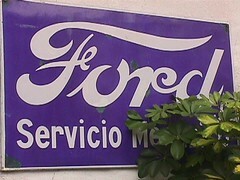 Ford car & spare and auto part show in Buenos Aires has ended, like always a great treat for all those Ford Car fans. Its one of the 2 annual fairs that takes place in our city, this month of April and then again in November. Not only is this a great event for collectors in general who find in it a gathering place, a reunion show were to get the latest news within the world of South American Ford collectors –and why not, collectors from around the globe too!- but this is also the best place for dealers and collectors to buy and sell special Ford car parts, manuals… you name it, they have it. Bob Frassinetti. Copyright 2006 Updated 2017. Roberto Dario Frassinetti. Overland Travel Adventure Tour for Argentina & Chile. Rally Car Tour with Bob Frassinetti. After a day or 2 here and around these places we will carry on travelling towards Chile, going via Rosario, Cordoba and then Mendoza, seeing the Pampas, the Andes Mountains visiting Wine Bodegas, wonderful unique sights, searching town by town for Arts and Antiques, for those especially interested in old tractors steam engines we will also be hunting them, likewise for those insulators collectors, and visiting Museum and Art Galleries on all mayor stops, this adventure is not only about “hitting the road, jack” but also looking out to a parts of the world, that are rapidly changing and it might be one of the last times do see and document it before “man and the weather” change it for ever…. See sights and sounds like maybe have been the same for hundreds of years, remote villages, high up in the mountains or across in Chile. So we will be also crossing over to Santiago de Chile, the Pacific Ocean, Valparaiso, and then down south to the Big Island of Chiloe, this mystical and magic island, with hundreds of churches and strange wooded buildings over the sea, lighthouses and many islands to visit, and then back crossing over gain the Andes mountains, back across to Argentina, Via Esquel, Route 40, Ruta 40, seeing and travelling on trains, crossing lakes and bays, on paved and unpaved roads, hunting antique tractors, visiting lighthouses and museum, buying art and antiques and sleeping in small towns and villages some times in top notch boutique hotels other time in down and out places… Bariloche and Puerto Blest, for those by now tired out can catch a flight back to Buenos Aires, then home, or for those willing to spend Christmas and New Year in this part of wild South American and in style can carry on with me …….. Eating and tasting local foods and drinks, as well as wines … the idea is to have a total adventure in places I have already travelled to and others that I’m not familiar with. All this, for an adventure, that could well turn out to be ……… a drive of a life time. We would be travelling in a 4 wheel drive vehicle, 4WD this is a good on and off road vehicle, with all the equipment necessary also for camping out a night or 2 on the road, when its nice to ….. so far the idea is still being worked on, so its subject to some change, all I wanted to check out with this auction is if there are any possible candidates who would be willing to accompany me…… at the same time we would be documenting the trip for deferent purposes… I have worked out some kind of cost for the trip, its based on a daily rate per person, this doesn’t include any extra expenses but only the use of the vehicle and me driving it (included all running costs of the vehicle, me, there the 24 hours helping, couching and providing information on the sights we will see ) and insurance, it would be US $190 per person per day of adventure, minimum days 21, calculated on a base of 3 passengers and if all seats are occupied and sold here at auction, today or in future run up auctions. Great trip for a family of 3, friends, or adventurers who never got the chance to be one…… and why not just for those lovers of art and antiques who want to experience pure fun a dn the sport of hunting down items, village by village town by town ….. All other expenses; from trip down, to Buenos Aires and back home, from food lodging here and on the road and all personal expenses all the way to medical costs if any, all , and each expense for each person, are apart, are to be paid by each of the individuals doing the trip, and you can do this threw your local travel agent or any way you feel fit in doing it. There are some risks involved so its best only to do trip if you are in good health and to let me know of anything before hand. Some information on myself, Lonely Planet has me listed as a “friendly and bohemian art dealer guide” on page 49 of its latest edition of Lonely Planet Guide for the city of Buenos Aires. This guide was written by Sandra Bao, and is just out, by the way, a great in view to our City. I'm also known on Internet online magazines and forums where I publish my insiders’ articles and inputs for travellers & dealers on art to antiques dealers, just Google my name! Or Yahoo! I’m a qualified eBay seller with great feedback! And I have been on line on eBay since 1998. That goes back a long way for Internet users. I also sell Books on Route 40, Argentina. You can alos buy books and Route Guides like this one The Magic of Route 40 by Federico B. Kirbus. If you would like to take part in any of our tours or in this interesting rally venture or just are looking for information on Route 40 Ruta 40, Argentina, please don’t hesitate to contact us directly thru email, phone or chat. Press here: Contact me See "artdealer_ar" profile on Yahoo, I'm online now! :You can chat with me using Yahoo Instant Messenger. Email : Email Bob Frassinetti. Press here to go back to web page Route 40 Argentina:Daily Updates for Route 40 Argentina. Bergantin Ika the story behind the scene Kaiser Industries Argentina was one of the first and foremost important automobile manufacturers during the 50s until the early 70s when it merged with the French Colossi Renault. It was 1959 when IKA began to develop a new and avant-garde project to suit the needs of the sophisticated upper market consumers of Argentina. The concept was named Project X 60, and the idea behind it was to produce a vehicle of great style and sophistication, with new and innovative lines, but to do it using as much as possible of the local developments. This might appear as a rare combination of words to a non Argentine reader, but the fact is that as late as the early 60s the local auto industry consisted mainly in assembling of parts imported from the main production centers such as the US, UK, France and Germany. Along with the first impulse provided to these industries by means of a very flexible import-export tax system, appeared the necessity of developing the local industry to produce entirely the vehicles in the country. So when IKA began to develop a broad and integral production system in our country, it was a turning point both for the industry and the consumers. The man behind these ideas and projects was the famous and brilliant James McCloud. He was the one who organized the Santa Isabel plant in Cordoba, where IKA produced the famous Jeep, Estanciera and Kaiser Carabela. McCloud thought that the best way to achieve a sophisticated design to be locally produced was through means of a joint venture. He then head to Europe. It would be in Italy where he would find the perfect match between the American concept mechanical parts and European Style designs. Alfa Romeo sold McCloud the no longer produced Alfa Romeo 1900 Berlina matrix molds. 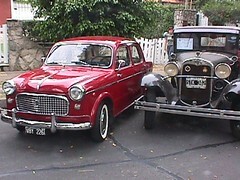 Brought to the country the 1900 Berlina would become IKA Bergantin in 1960. The parts made in Cordoba were the four cylinder engine of 2,480 cubic centimeters, as well as the back bridge of the Jeep and the drum brakes that were used in the Estanciera and an Emeta instrument board. All in all, Bergantin blended in superlative manner Alfa Romeo’s finest features with the best local mechanical products. 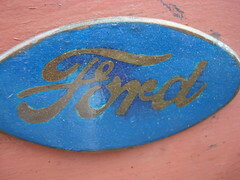 Production began on March 10th 1960 and ended on February 21st 1962 after launching nearly 5000 units to the market. There were three versions made for IKA Bergantin: Standard, Deluxe and Taxi cab. Notwithstanding its short production life, in 1961 we spot a turning point for Bergantin models. It was then when IKA decided to incorporate its fine Continental six cylinder motor engine –already used for the Estanciera and Carabela models- to the Bergantin model. Only 353 units were made between May 31st 1961 and February 22nd 1962. Another indication feature were the two color combination of its chassis and its tremendous power, reaching the 165 km/h and 115 HP. 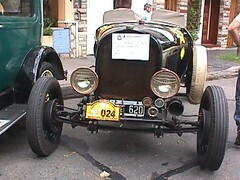 IKA Bergantin was a true Argentine hybrid that had a short life due to the mismatch between the vehicle and the engine. However, the fact that such a small automobile featuring such a big engine managed to work out as a working car has raised interest among the sophisticated world of auto-car collectors. This rare and limitedly produced Argentine version of Alfa Romeo’s gem is a one of a kina product cherrished by those who enjoy the uniqueness and inventiveness within the history of automobile productions in the first half of the 20th century. Motorization: 4 cylinder-Model 41-151-4 cyl. In line-84,138 mm x 111,125 mm. Compression: 6,86/l-power: 115 HP at 3.800 rpm-Cupla: 24,89 Kg. at 3.800 rpm-1 Carburator Carter WCD 2204S descendant-Cylinder line:3.707 cm3. Transmission: Three gear box MA-2nd and3rd synchronized- Wheel command- Diferencial relation 4,9/l. Suspenssion: Front independentmeans and Back stabilizing hydraulic-Sweep shock absorbers with rigid axis and hydraulic-4 shock absorbers arms reactors. Brakes: Drum brakes in the four wheels.Measures: Between axes 2.620 mm-Tr. Of. And tra. 1,336 total mm-Long 4.440 mm-Height Maxima 1,510 mm-Weigh 1,270 kgs.Other data: Terminal velocity (4 cylinders) 145 kmh-6 cylinders-165 kmh-relation weight power: 4 cylinders 17.33 kg. The Art DEaler Rally Club. So far we’ve presented our project for a Rally car Club of Art Dealer. What we’ve done is to put into words, ideas and images that have been turning in our head for a long time now. Because our readers’ and friends’ opinion maters greatly to us, we have placed as follows the reactions our project has had on our friends. Fantastic idea!!. We re in Uk now where a rally from london to lisbon is on. When home i will forward websites with similar but not as exciting schemes. And this from Giuseppe of the USA....... and his email reads,"it looks like you are going full speed ahead. i like what i read on your site. is it working for you? have many people made enquiries? i like the rally concept. you should make enquiries into placing small adverts in some of the sports car magazines. "Octane" is one which is printed in england, and "Classic Cars" is another, which is also printed in england. they always have articles about rallying and racing and such. And our friend Mike form Somerset, England said," I also got round to reading some news about your trip. I couldn’t access the site yesterday so it had to wait until today. I like the vintage car idea and hope it works well for you – great idea ! about that. I'd like to know how that works out for you. And from the UK, England,Olaf said; " I like your idea about 'timeshare' rally cars. There's something similar in principle in the UK targeted at high net worth individuals; city high fliers, entrepreneurs. It involves paying an annual fee to belong to a kind of Supercar Club. You get to choose from Bentleys, Mercedes 600SL, Aston Martin's, Lambo's....etc. You can own it for 6 months (all taxed, insured, serviced) and then send it back and order another car! And so on. Transferring the idea to antique vehicles and rallies seems eminently workable. There must be loads of Americans who would love the idea of dressing up complete with goggles and taking part in a reenactment of a rally. Might be a bit tough on the spare part situation but I'm sure you have that covered. Thank you Olaf, who by the way is coming down to travel Route 40 on a 4 WD! Lucky Olaf! Kaiser Frazer Carabela Manhattan, made in Argentina, the traditional Kaiser Frazer Carabela, as we pointed out in our previous articles was local version of the 1951 American Kaiser Manhattan and the 1953 high-end version Kaiser Dragon. 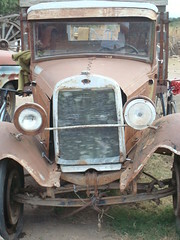 This was the first sedan model car to be produced by means of the modern assembly line system. It featured 4 doors, the Ika Continental 6L 226 motor, 3.707 cm3 cylinders, 116 CV power as well as back traction; among many other outstanding features, coming in a variety of sophisticated 1950s pastel colors. Here you can see it made in scale 1/43 in resin, hand crafted in small numbers, a rare toy indeed.....For more information :Email: The Buenos Aires Toy Museum,Bob Frassinetti. Press here to go to the Toy Museum :The Buenos Aires Toy Museum, Argentina. Ruben lives in the Western province of Mendoza at the bottom of the Andes Mountains; just 20 km away from Mendoza Capital city. He lives in a small town that looks pretty much like the French countryside. Ruben is a family man who has a strong and interesting passion, his Citroen 2CV. We know for a fact that Citroen and more precisely its 2CV models were milestones in Argentina's auto history, in projection with the role these vehicles have played around the world. Ruben's story is just one of the many passionate stories we have found regarding the strong impact 2CV's have had on Argentines. We chatted with him this morning to know a bit more about his personal story with 2CVs, what they mean to him and a bit more. Ruben bought his 2CV 10 years ago in Mendoza. He bought it from a man who had it for over 20 years and kept the vehicle in superb conditions. His Citroen 2cv was made back in 1964 in Argentina. It has a 14 hp, 425 cc engine with centrifugal engage clutch, Michelin pneumatics, original tapestry, users' manual, radiator tent as well as the original fabric roof top in blue. The model was known as the 2CV de luxe due to some sophisticated details such as the third window, chromed hubs and bumpers as well as side and front moldings. He also has some of what we call the collectors treats: original purchase invoice from 1964.
had 2CVs since he had the possibility of earning his own money. an unappealing car for the countryside and then it became a world trademark. to his youngest son, Facundo. 2CV image, working on a transition into slimmer lines and modern vehicles. share the new winds blowing under Citroen wings'. traveled half around the planet to take part of the show. finds its way through poetry to reach other collector's hearts. The mighty Jeep vehicle played an extraordinary role in history even during its first years in World War II. Participate in our Overland Estanciera Station Wagon Tour?we invite our readers to imagine the wonderful feeling of touring the adventurous Argentine routs aboard a classic 4WD. When in England, tour aboard a Land Rover, when in Argentina, do what classy Argentines do, tour aboard an Overland Estanciera Station Wagon built in the 1950?s. Arriving to the world?s southernmost country brings upon fantasies and dreams. The broad lands of Patagonia that bewitch travellers from all latitudes, with which celebrities such as Ted Turner and Sylvester Stalone have fallen in love with? The gorgeous Andes sites in the middle of altitude valleys and millenary cultures captured the heart of anonymous visitors in the same way as Donald Hess felt he had found his place in the world. 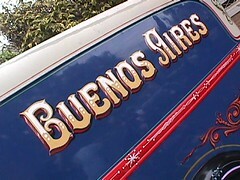 Buenos Aires and its estancia-ranches, great life and gorgeous sights capture the eyes and heart kings, queens, hirers. Get ready to enjoy the same sights and pleasures these visitors had in their frequent visits to Argentina. Art Dealer is developing the ultimate great life Overland Estanciera Station Wagon Tour, along all these sites and places. Aboard one of Argentina?s auto industry greatest trade marks, you?ll get to experience the true feel of our unspoiled paradises, best hotels and true amazing food. The best way of enjoy Argentina is as its lovers do: in style, sophistication and taking the pleasures of life. Introduced a year after the first civilian Jeep vehicle the Willys-Overland all-steel station wagon is an auto industry icon and milestone. The original Jeep vehicle was born of necessity and hand-built in just seven weeks with lots of hard work and genius to fit the US Army needs back in World War 2. The Army put out a call to automobile manufacturers asking for a running prototype for such a vehicle in just 49 days Willys Overland ended up supplying more than 330,000 units. The evolution of the 1946 Willys Utility Vehicle has come to our days as Cherokee and Grand Cherokee, a true trademark of 4WD and utility vehicles. The 'Jeep' station wagon had pressed steel framing and three-tone paintwork which simulated the wood look. It used Jeep running gear and MB-style front sheet metal and was designed to compete against the "real" wood wagons still being manufactured by Detroit's Big Three. 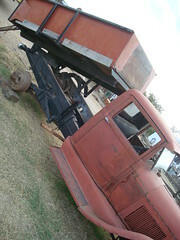 The new vehicle chassis was also available in a sedan delivery truck. Four-wheel-drive would become available in these models in 1949 along with the 148 cubic-inch 'Lightening' six-cylinder engine. The 50s saw Willys-Overland four-wheel drive all-steel station wagon develop and conquer the world, and even licensed out its manufacturing to companies in Japan and Argentina. In 1953 Willys-Overland, the original developer of the Jeep vehicle, was sold to the Henry J. Kaiser interests for $60 million. 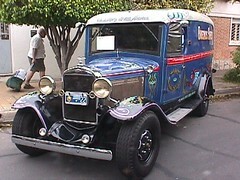 In our country, the original Willys became Argentine Kaiser Industry –IKA- trademark under the new concept of Estanciera 4WD. The ownership of Willys has gone a long way now… The story tells that by 1950, Willys obtained a United States Trademark Registration for the Jeep trademark. Since then, ownership of the Jeep trademark, which is also registered internationally, has passed from Willys-Overland to Kaiser to American Motors Corporation, and most recently, to Chrysler Corporation. Today, Chrysler Corporation owns over 1,100 registrations for the Jeep? trademark throughout the world.